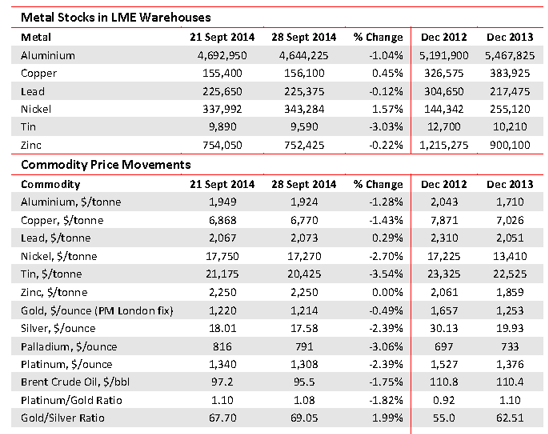 Neither the movement in warehouse stocks nor metal prices was indicative and whilst the pressure remains down, some trends emerge. Indonesia has compromised with Newmont, to allow copper concentrates to flow again and tin has also loosened up. We are warned of a pending zinc shortage as major old mines close and are not replaced. Ye has an economic recovery remains on the cards for 2015 onwards, we see forward prices holding firm. These numbers are in contradiction to what many analysts fear. On copper, they note that what was going to be a massive surplus shrinking to about 285,000t in 2015 out of a 20Mt market. As ever the pick-up in the US economy is cited. Backing this are majors MMG who, with Chinese partners, strong armed Glencore into selling the developing Las Bambas mine in Peru, slated to build up to 2Mt/yr copper in concentrate, starting in 2015. Zambia has got its knickers in a twist over copper exports. It levies VAT on metal leaving the country and only repays it on proof of arrival at destination. A problem, as the goods can change hands several times before final delivery. The Chamber of Mines has weighed in on the miners’ cause pointing out the crucial nature of copper exports to the country, like 750,000t/yr and 90,000 jobs. Aluminium owes its rosy forward picture – see above – to some producer led restraint in the downturn, although stocks remain high. Of its three stages of production, the conversion of bauxite to alumina then to aluminium metal are energy intensive. So it makes sense to do them where power is cheap. Thus the UAE, via State-owned Emirates Global Aluminium, plans to build a $3bn aluminium refinery in Abu Dhabi. It will build to 4Mt/yr. The zinc story will run. Nobody has more of a vested interest than major miner and trader Glencore which, following its merger with Xstrata, has over 15% of mining clout alone. The warning is about the impending closure of big, tired old mines with a deficit looming as early as next year. WIM says: The market does not share this view. The price backwardation to early 2015, as we show, is almost 14%. LME stocks alone are 23 days world needs, compared with its stablemate lead at 9 days. One to watch. Shares were down on the week, but up on the year.